Small Box Games Offers Three Games in One Kickstarter Campaign! My first experience with Small Box Games was when I Kickstarted their game Tooth & Nail: Factions. It was a great experience—the game came when they said it was (even earlier, I think! ), and the quality was great. So I was excited to get an email from them announcing a new Kickstarter campaign. I was pleasantly surprised to see the campaign is for not one, not two, but three different card games! 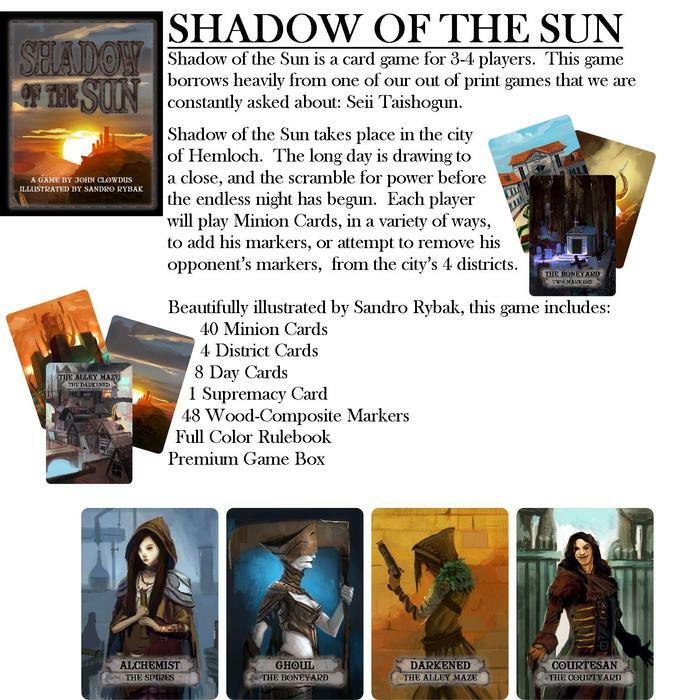 Shadow of the Sun is for 3-4 players and is set in the city of Hemloch—one of Small Box Games’ other games. The Valkyrie Incident is a deck-building game for 2 players. And Stone & Relic is a kingdom-building game for 2-4 players. If you back just one game, it’ll run you $23, including shipping. $44 will get you two of the games shipped, and $62 gets you all three games. This is an interesting strategy. On the one hand, $23 is very reasonable for a quality card game, but as you ramp up the price, $62 seems expensive. It’s not that it’s a poor value, but rather that’s a lot to spend at once. (It’s certainly more than my gaming “allowance.”) It doesn’t seem to be affecting the campaign at all—after less than a day they’ve very nearly hit their funding goal, and the vast majority of backers have opted for the all-three-games option. From the Kickstarter page you also download and read the rules for all three games, so you’ll have a good idea about each game before you plunk down your hard-earned money. Will you back any of these? How many? Which one are you most excited about?